A cheerful and fun pirates design full of brightly coloured pirate mates and a captain for that swashbuckling little boy. 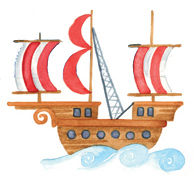 Pirate ships and treasure chests add to the colourful illustrations along with parrots and the Jolly Roger flag. The colour of the pirate ship sails and the pirate outfits are selected to contrast against whatever colour lettering is chosen. This design works well in any number of colour lettering, be that blue, red or green.